residing at the ceremony wasJoyce Campbell Vanatter, chapter regent and Patricia Burson Jennings, chapter chaplain. A biography of John Morris Foght was read by his 6th great-grandson, Stephen Risser; and 7th great-great granddaughter, Lauren Risser. Diane Wappner Kracker, 5th great-granddaughter and her two grandchildren unveiled the marker. Ebenezer Zane Chapter, Ohio State Sons of the Revolution posted the colors for the dedication. 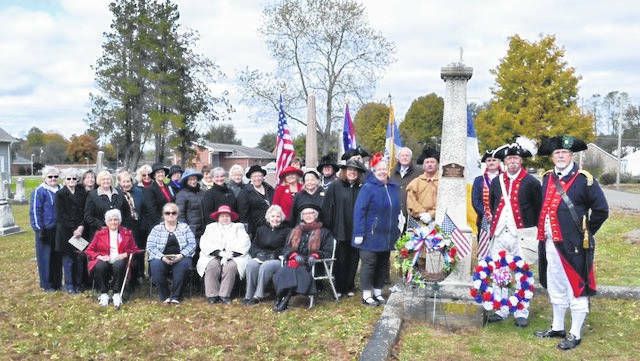 In attendance were OSDAR State officers, OHSSAR Sons of the American Revolution, 24 members from seven DAR chapters, city officials, family and guests.